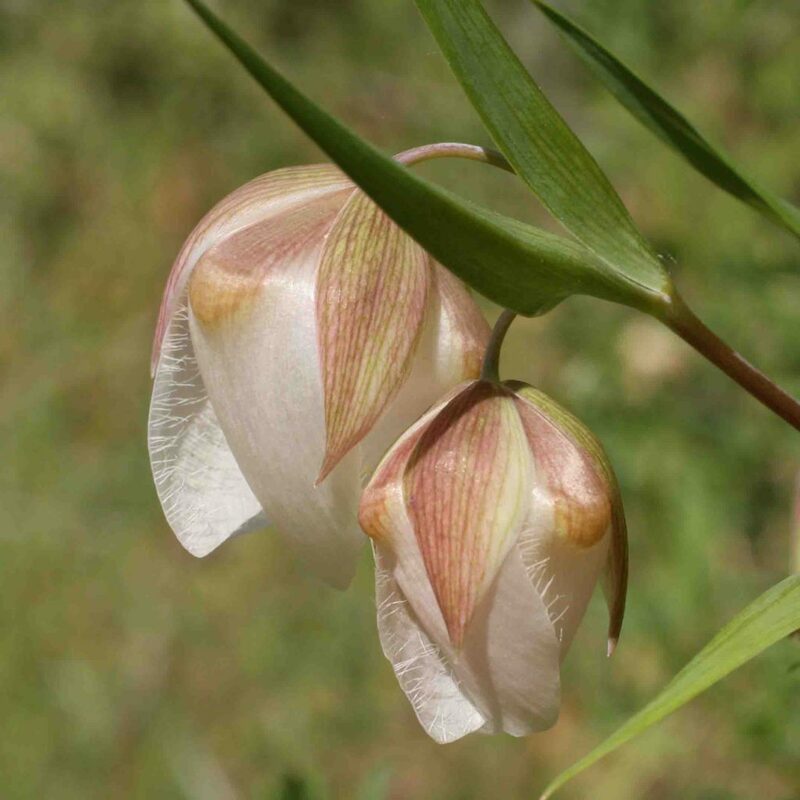 Very common and unmistakable. 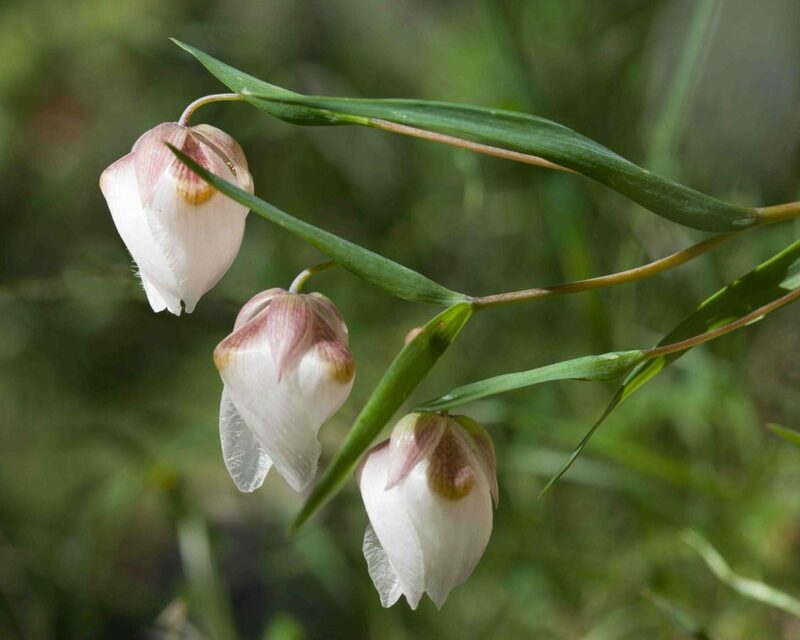 Pendulous flowers have three, delicate, hair-fringed, creamy-white (occasionally pinkish) petals, each with a protruding hump where the nectar gland is to be found inside the flower. 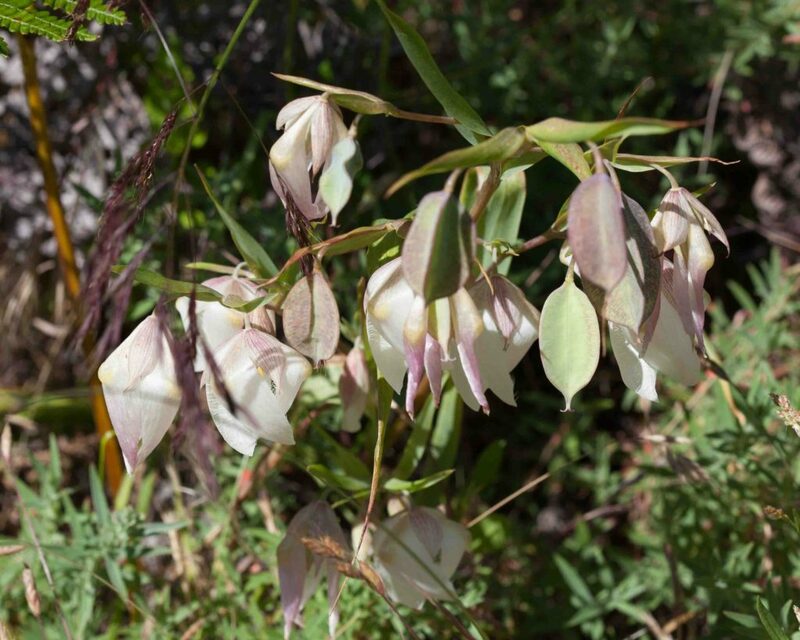 The 3-sided seeds pods are distinctive and surprisingly large. 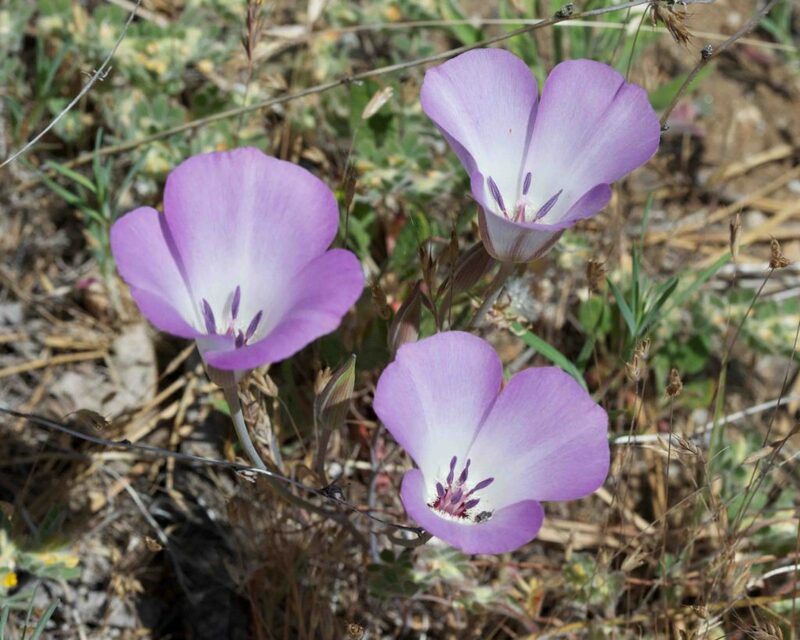 The location of the plants can be identified early in the season by its single, strap-like leaf lying prostrate on the ground. 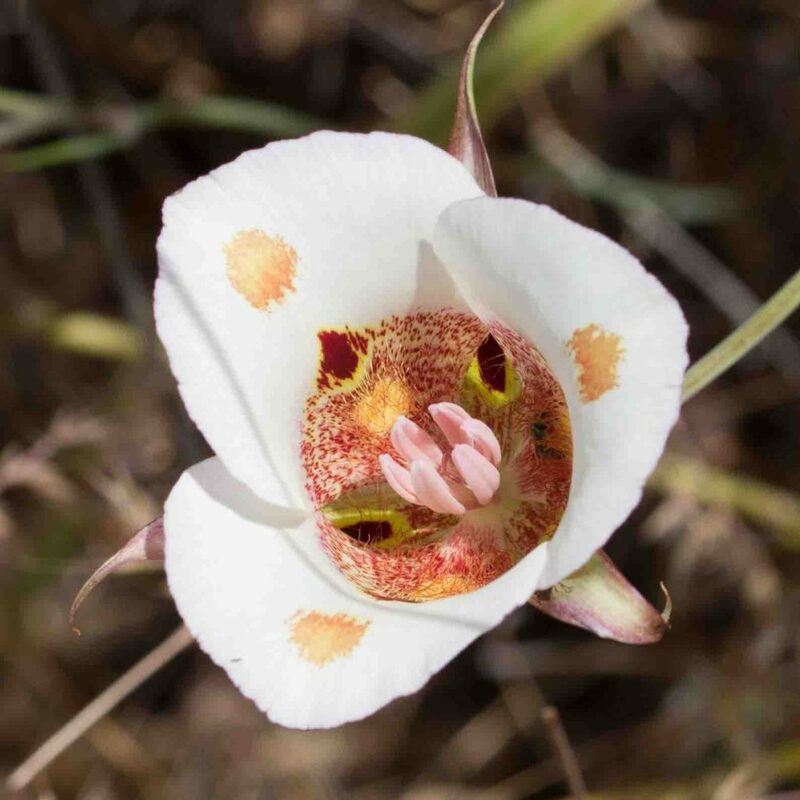 Unmistakably a mariposa lily with its bell-shaped flower, upright with three large petals and long, slender sepals. 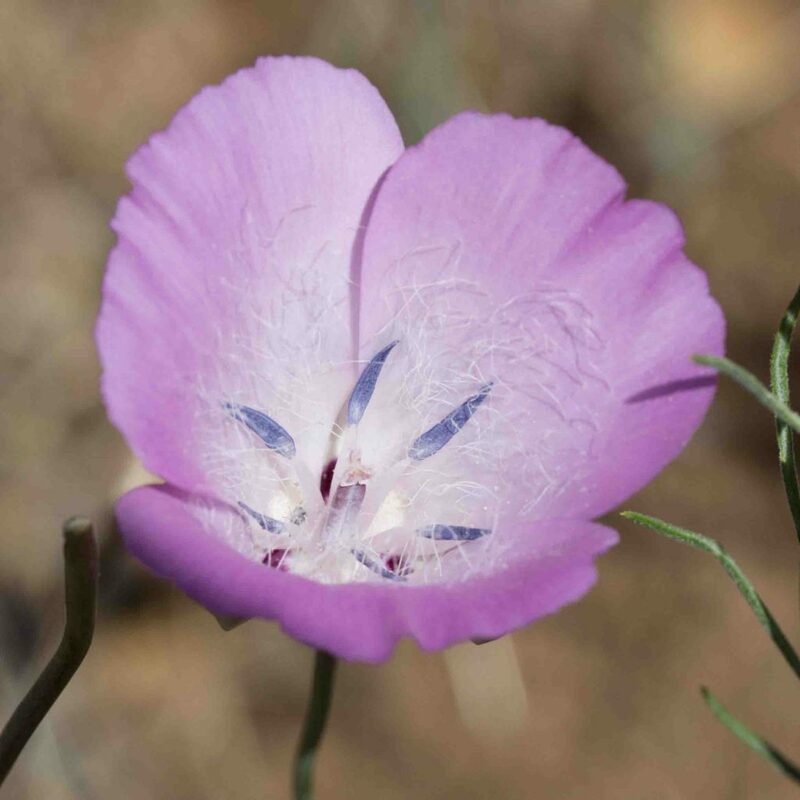 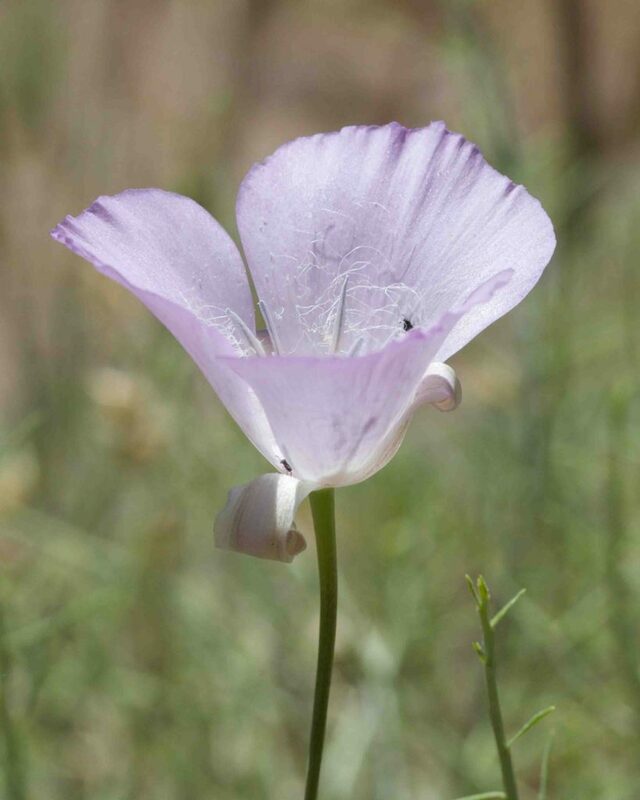 Flowers are white to pale lilac, very similar to Splendid Mariposa Lily (Calochortus splendens), but easily distinguished by its sepals (which are appressed to the petals rather than recurved) and by the short hairs comprising the fringed membrane around the sunken nectar glands at the base of the petals. 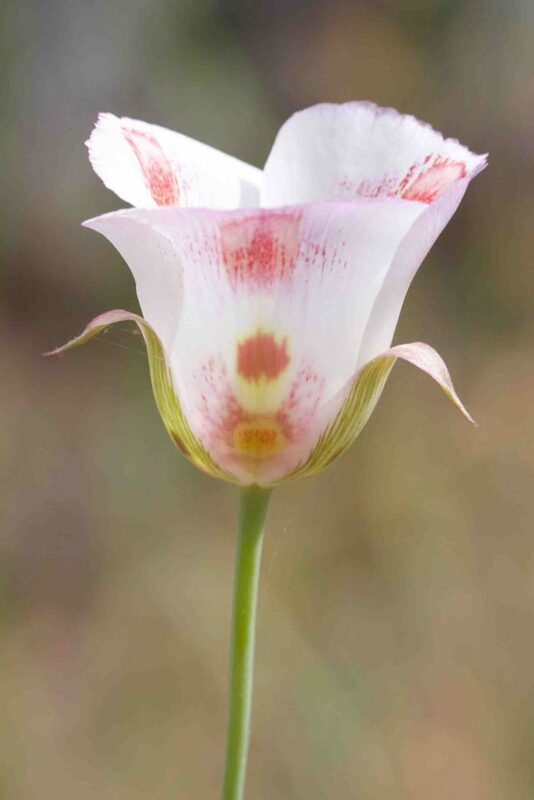 Unmistakably a mariposa lily with its bell-shaped flower, upright with three large petals and long, slender sepals. 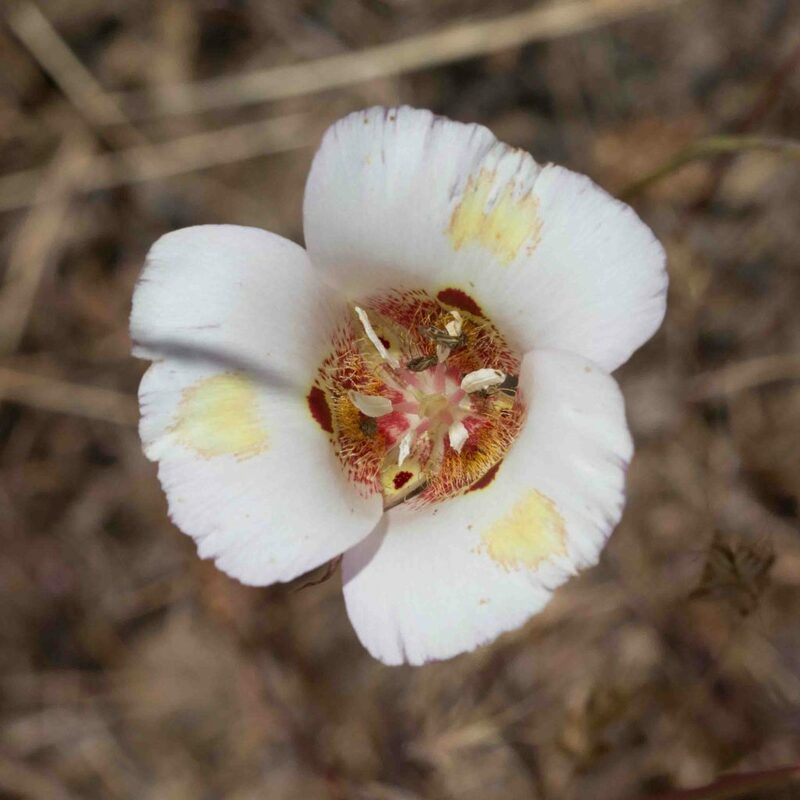 Flowers are uniformly lilac, occasionally purple-spotted near the base, very similar to Plain Mariposa Lily (Calochortus invenustus), but easily distinguished by its sepals (which are typically reflexed rather than appressed to the petals), and by the inside of the petals which are densely long-hairy with nectaries that are not sunken (rather than having a fringed membrane around sunken nectar glands). 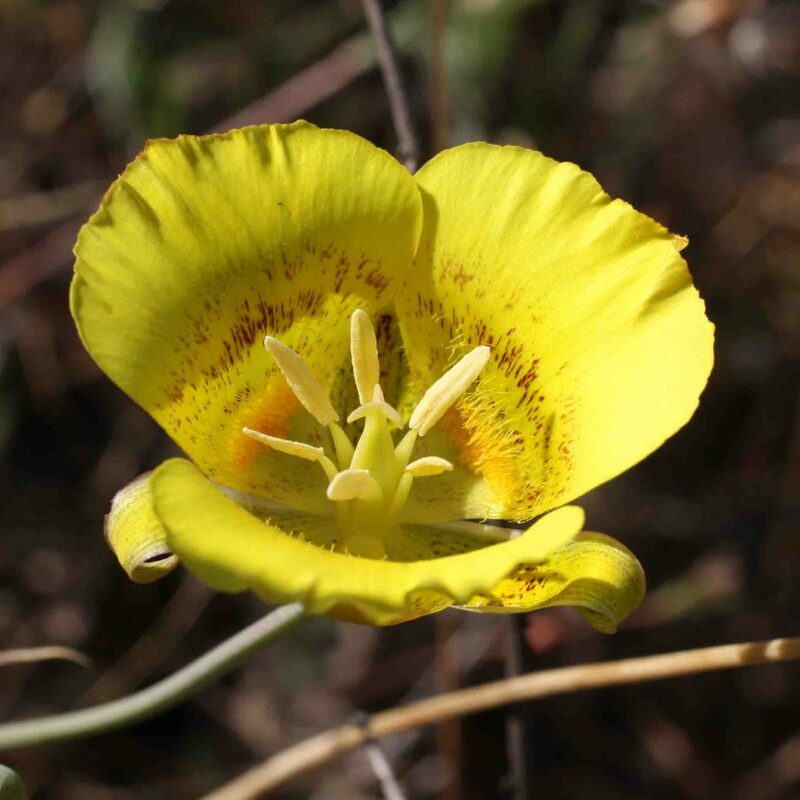 This is a common but beautiful mariposa lily with intense lemon-yellow flowers, marked with red-brown lines and/or blotches in the mid area of the petals. 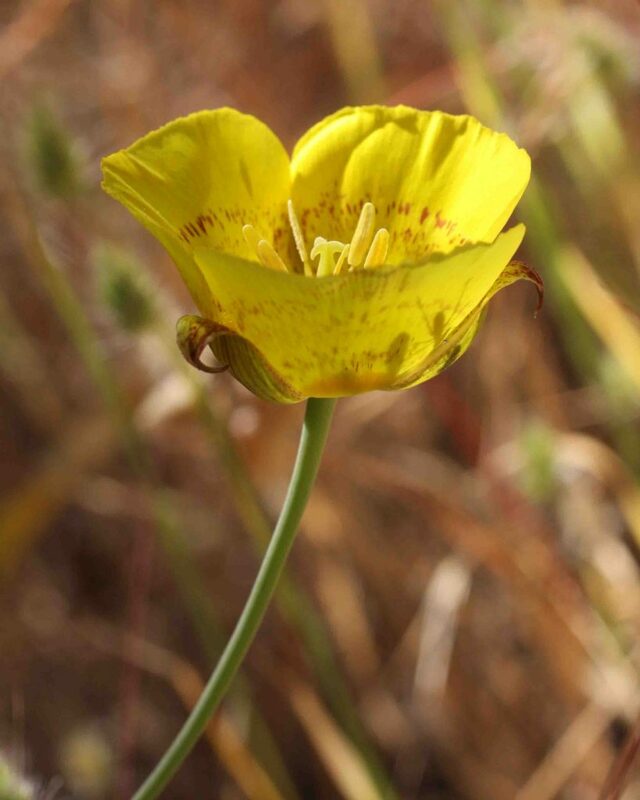 There are dense matted short yellow/orange hairs on the nectaries near the base of the petals. 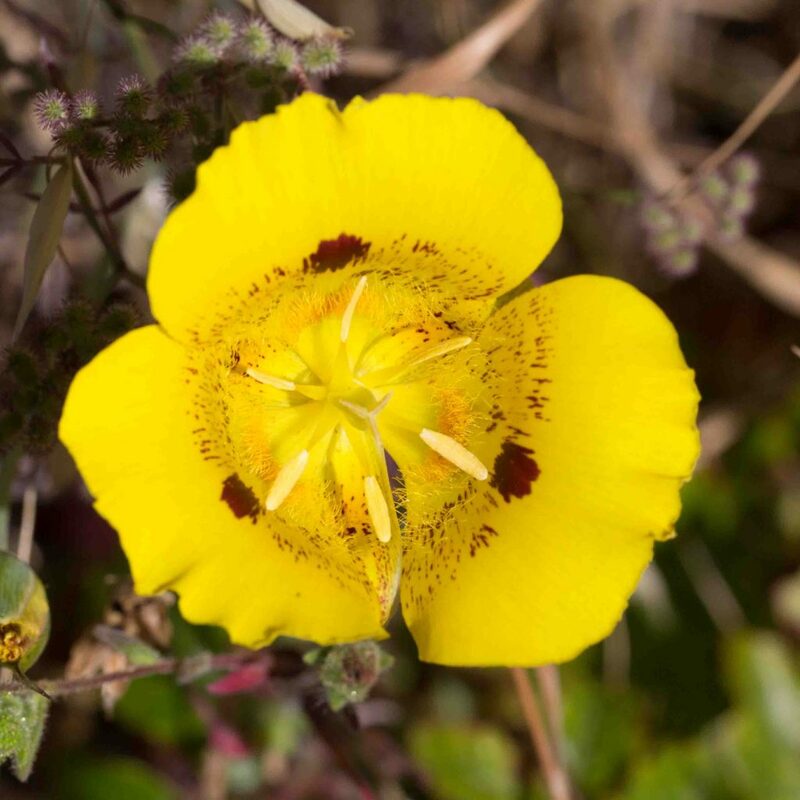 Mostly found on and around the Monterey Peninsula away from the immediate coast. 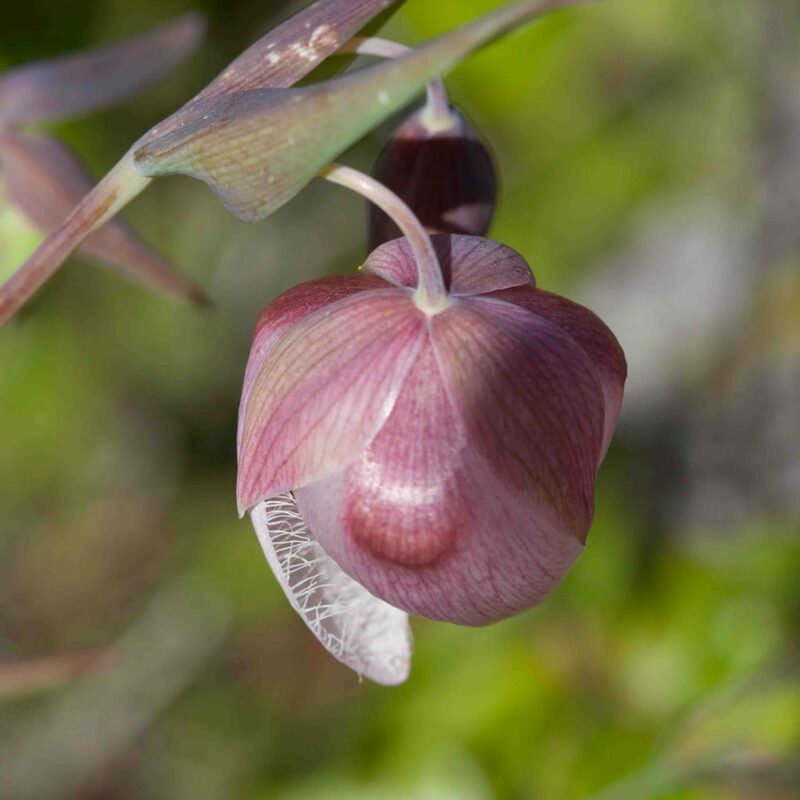 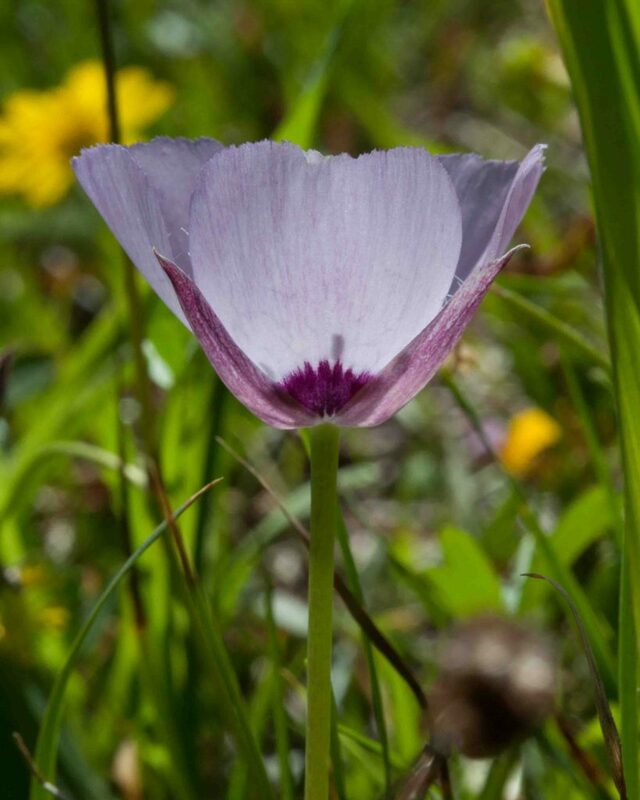 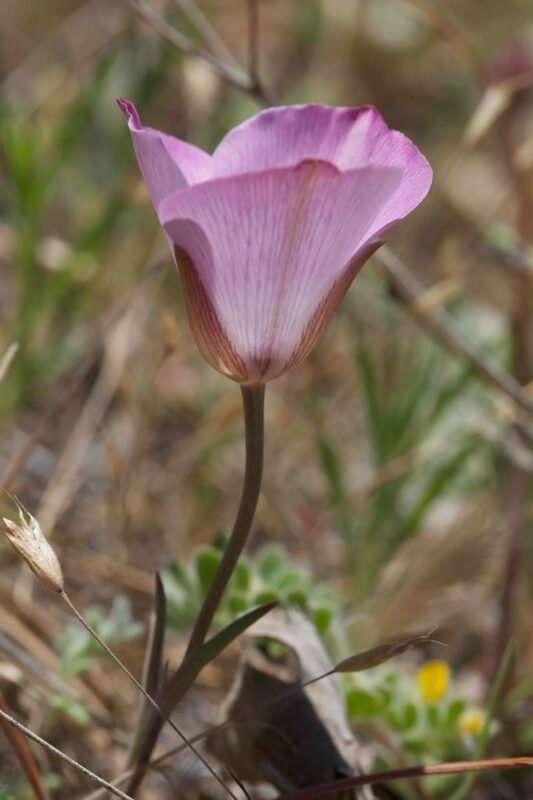 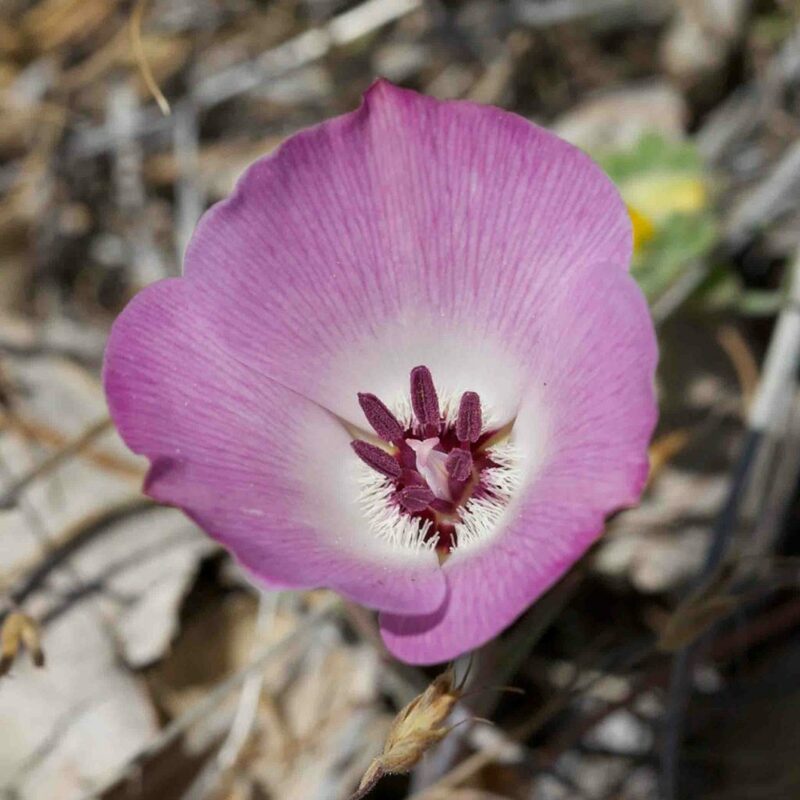 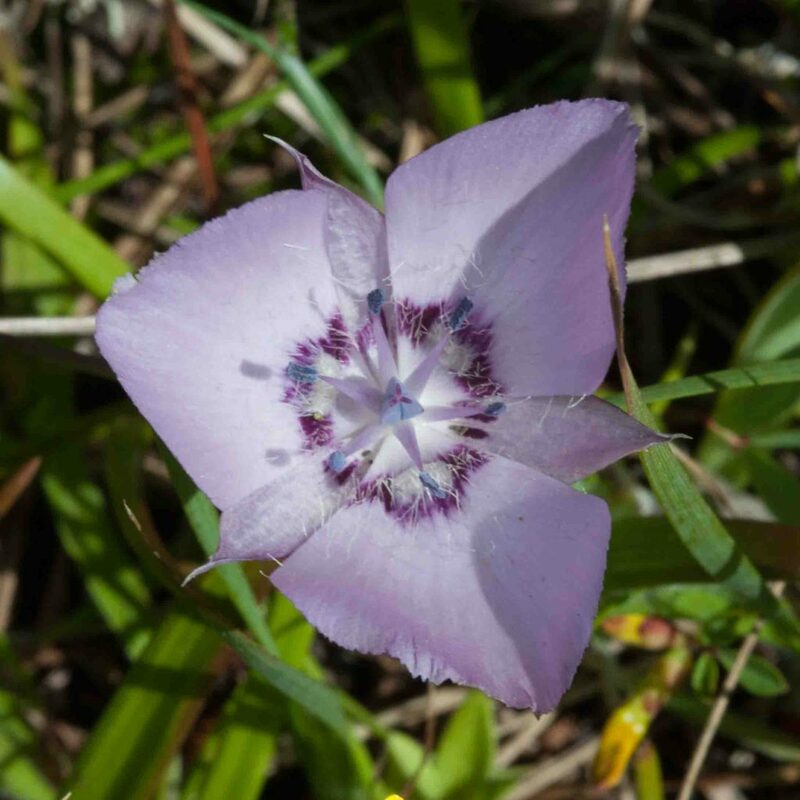 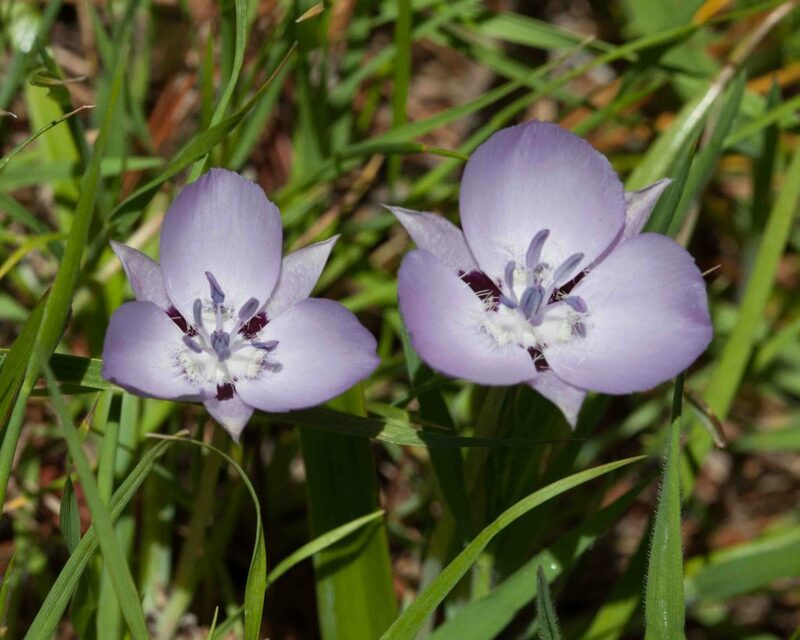 Despite its name, this is also a mariposa lily, found in coastal areas, mainly on the Monterey Peninsula. 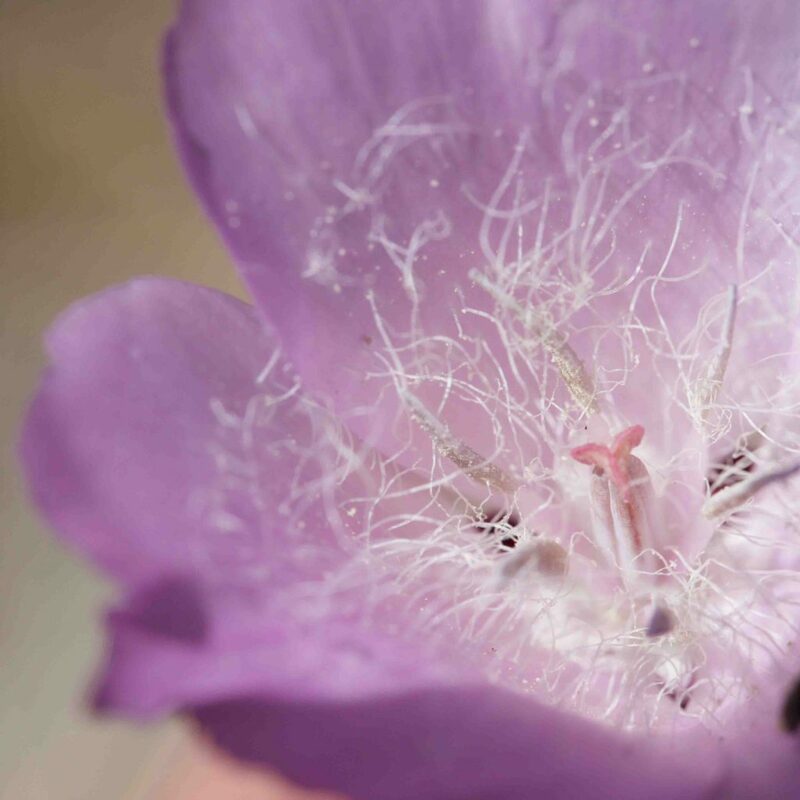 The flower is white to lilac with fine hairs and sometimes purple blotches surrounding the nectar glands which are covered by a broad fringed membrane. 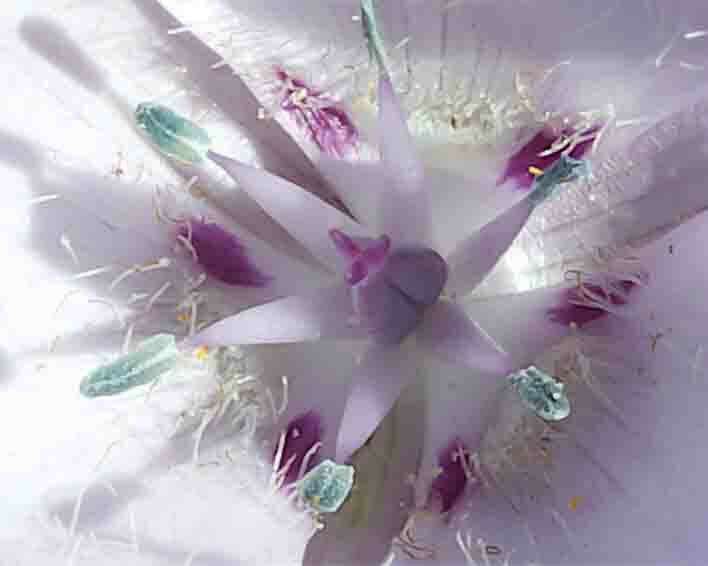 Each stem bears a single flower (hence “uniflorus”) but there may be as many as 5 stems arising out of a single bulblet, blooming in succession. 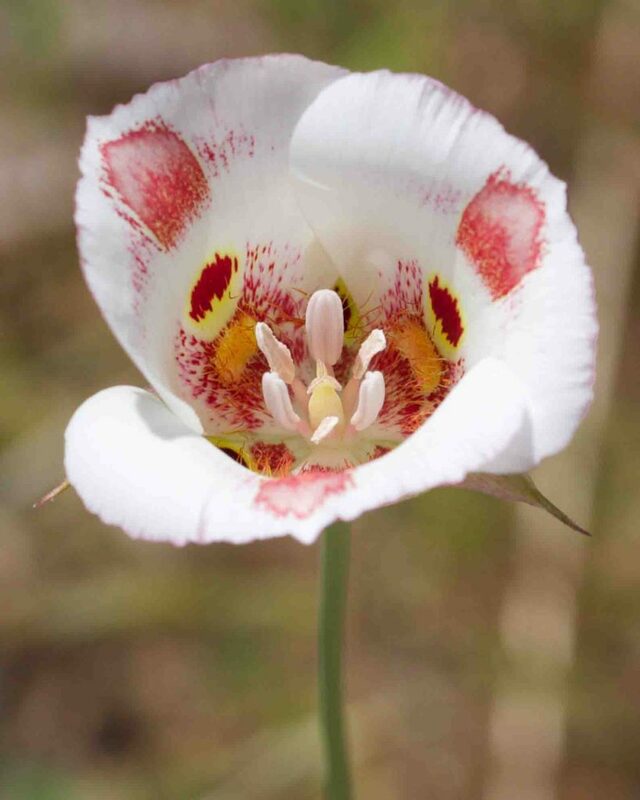 Extremely variable in its coloration (white, yellow, pink, purple or even dark red) and markings, but most commonly white with pinkish markings, this is exceptionally beautiful even by mariposa lily standards. 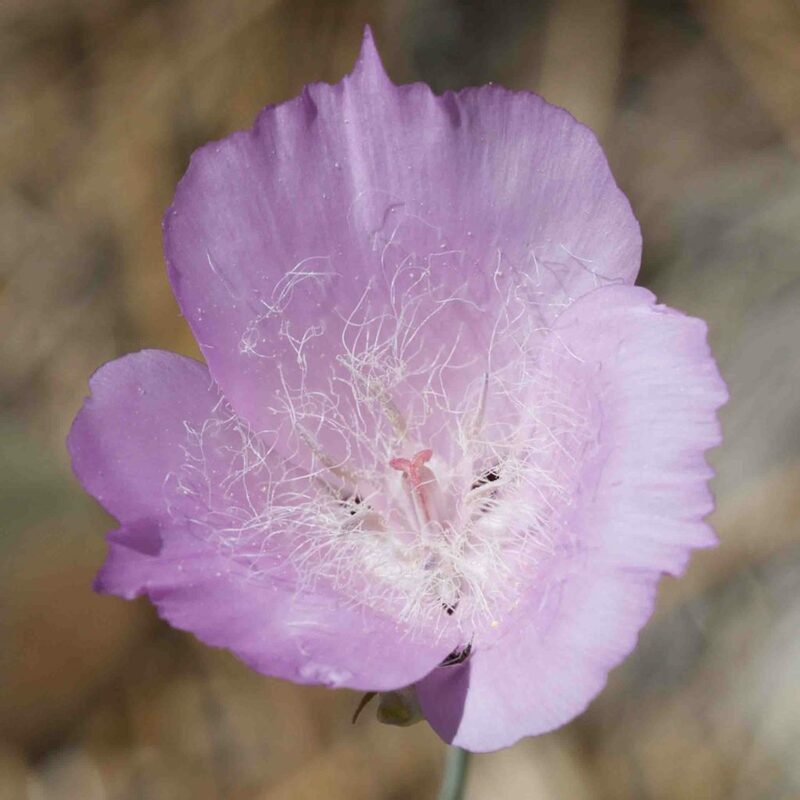 Petals have a large red blotch near the base with a second paler blotch above. 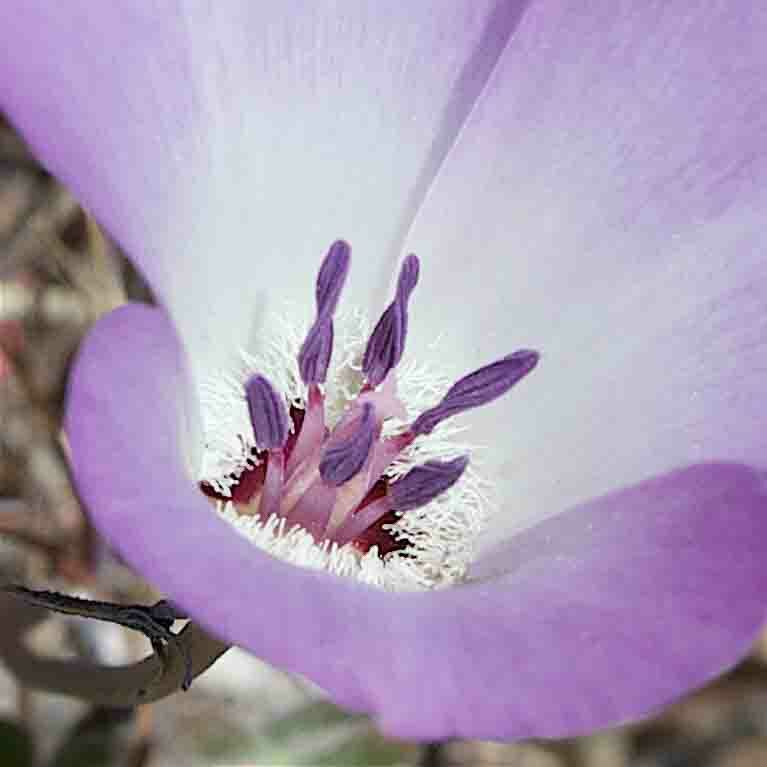 Petals are sparsely hairy near their base. 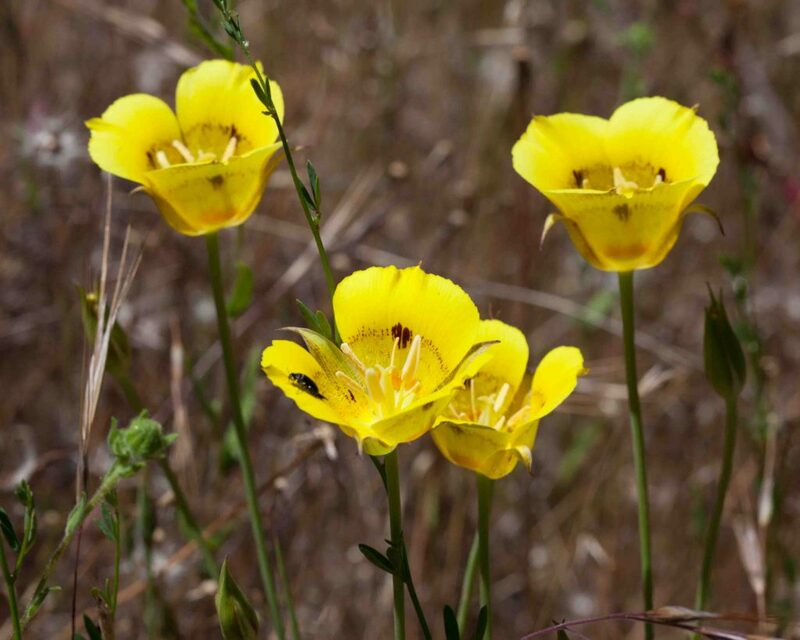 The nectary is more or less square with short yellow hairs.